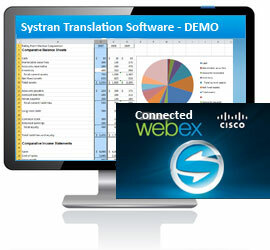 See the actual SYSTRAN software in action! With an interactive 1-on-1 demo session, or webinar session you can watch a professional Systran Traininer via one of our popular desktop sharing tools, WebEx or JoinMe. The demos can last anywhere from 10 minutes to 1 hour. To schedule one of these interactive demonstrations, fill in the above information and click the SUBMIT button. We will contact you to schedule a time that is most convenient for you. Whether you are just a personal individual user or need to schedule a large group we can help give you an insight to software and how it can be a benefit to you or your company. If you don't have time to wait, no problem! Call us, we might have a trainer available now to walk you through the software now. It only takes a few minutes to give you a quick overview. 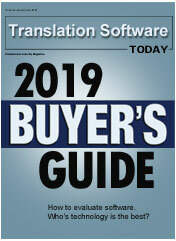 A picture is worth a thousand words, a live demo can save you hours of researching translation software products to see if they will meet your needs! Send us a test document for the demonstration. 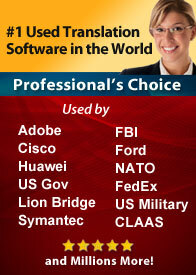 Watch as we translate your documents or sample files. Test the translation accuracy and in one or multiple languages. Learn which features will benefit you and your company the most. Reduce the amount of time it takes to make a decision about software as a solution.